Two years of attorney work finally paid off!Tony L.
Few people anticipate suffering an illness or injury that prevents them from working. The disability can bring confusion and concern to anyone who depends on their paycheck to support themselves and their families. If you are unable to work due to a mental or physical illness, you may be feeling confused, hurt, angry or even discouraged. Keefe Disability Law, located in the Boston area, represents individuals claiming Social Security Disability and Supplemental Security Income (SSI). Our Social Security Disability lawyers can help you too. 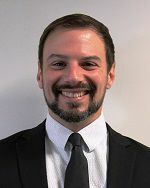 You may be reading this because you need to apply for Social Security disability benefits or have been denied benefits in Massachusetts, New Hampshire or Rhode Island. There is information that you need to ensure that you receive the best help in obtaining your monthly income and health insurance benefits. Dear Mr. Keefe, I want to thank you and your staff for all your help in securing disability benefits to me. It was very uncomfortable for me to ask for help in getting these benefits, but I must say that at all times I was treated with respect and dignity. I was so impressed with the sense of professionalism, courtesy, and the level of expertise shown by every member I had the pleasure of working with every step along the way... You and your staff have changed my life, Mr. Keefe... I wanted to personally thank you for all you've done for me. I will (and already have) pass your name to anyone I know or run into who may be in need of your help. Thank you again. 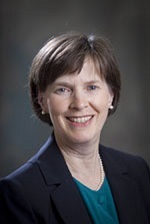 Lorraine O.
Keefe Disability Law offers educational videos, articles and FAQs to assist individuals in making an educated decision about their disability claim. Request our free book "7 Mistakes That Can Ruin Your Social Security Disability Claim" or call our office for a free case review. Do I need an attorney to help me win these benefits? ​Whatever your situation or individual needs, it stands to reason that hiring a skilled lawyer would significantly increase your chances for success, whether you are claiming Social Security Disability or Supplemental Security Income (SSI). You wouldn't try to treat your own broken arm, so why try to navigate the complicated world of a disability claim alone? 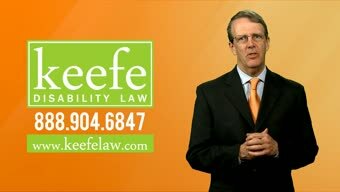 Keefe Disability lawyers can help you file the application or claim, point out specific medical records to the examiner, handle the denial on your behalf, file an appeal for you, get and submit your medical records, ask your doctor to fill out a questionnaire for the judge, attend hearings, point out specific sections of your medical records to the judge and provide you with additional options you may not have known about. 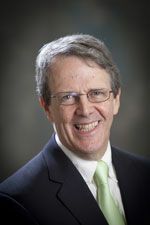 Social Security lawyer John Keefe offers materials to help educate his clients and the community so that they can be knowledgeable and proactive during their claim. 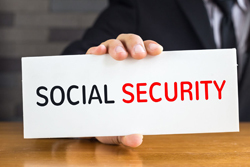 Let's take a look at the difference between Social Security Disability Insurance and Supplemental Security Income (SSI). Social Security Disability Insurance Benefits (SSD) is a government-based program that provides benefits of monthly income and health insurance to those who have worked and paid into the Social Security system but who can no longer work due to a physical or mental condition. If approved, the recipient will receive money from the government each month in addition to health insurance. It is important to note that in order to receive these benefits, a person must be unable to work at any job for at least 12 months - this includes a job that may be easier and/or pay less than your current or most recent position. Applicants for Social Security Disability must be at least 18 years of age and have medical records to prove their disability and inability to work. After the age of 65, workers no longer have to prove their disability and can apply for Social Security retirement, a benefit provided to the elderly in the United States. Supplemental Security Income is a government-based program that provides benefits to those who cannot work due to a physical or mental condition. In addition to showing that you are unable to work and meeting all the disability determination requirements described above for Social Security Disability Insurance, a claimant for Supplemental Security Income (SSI) must also show financial need. This involves reporting all income and assets to Social Security and being found to qualify by reason of financial hardship under Social Security's regulations. 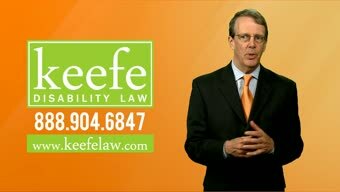 What makes Keefe Disability Law different from other attorneys and non attorney representatives in Massachusetts, New Hampshire or Rhode Island? Keefe Disability Law does just that - disability law. It is the only work we do. We have over 17 years of experience in helping those with disabilities and we are very familiar with Social Security's procedures and the great variety of medical reasons why people become unable to work. I want to take this time and say thank you for taking my case and helping me to get my SSI. Your associates I spoke with on the phone were very patient caring and understanding. 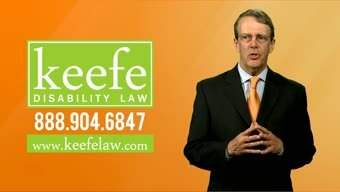 Attorney Keefe, you have a great team working with you. Again I can not thank you enough for all your help.Deborah. Don't Give Up! Social Security's statistics show that as many as 35 out of 100 who apply give up along the way. If you have not applied, we can help you with that. Let us do the application for you. If you get denied, don't get discouraged and don't give up. Don't let a confusing application process or denial influence the rest of your life. Get the information you need to know about Social Security Disability (SSD) and Supplemental Security Income (SSI) benefits by talking to the social security disability lawyers at Keefe Disability Law. We take calls from our clients when they call in. If a client calls in with a question, that client will hang up with her answer. Our staff of attorneys and paralegals is always ready to take your calls and emails. The attorneys and paralegals in our office are highly trained in Social Security Disability and each has ready access to the information in your case; if you are ever experiencing a problem, or need information, you can be confident that anyone in the office can help you. Nationwide, a prime source of frustration while working with a law office is having to leave a message for someone to call you back. We take your call live the first time, without sending you through a voice mail maze and without you having to wait to see if someone will call you back. That way, when you call us with a question, we handle the call by providing you with the information you called to obtain. We work together as a team with our clients. The more we learn about our clients, and their medical problems, the better we can help them. We want and need you to provide us detailed information about your medical problem, your education, your jobs and your duties at your jobs. We need you to tell us what you do each day. More importantly, the more clients learn about their claim, the more they can help themselves by providing us all the information we need to support their claim. If you need to apply, we will file the application for you. If your claim is for Social Security Disability, we can file an application for you online. Contact us for a free case evaluation and help in filing an application, or call us at (888) 904-6847. Should I hire a lawyer or non lawyer who provides services all over the country, a so called national firm? Well we think the answer is no. We are not a national firm, we serve a four state region. We help people in Vermont, Massachusetts, Rhode Island and New Hampshire - these four states are served by just four hearing offices - Springfield MA, Providence RI, Boston MA and Manchester NH. We regularly appear for hearings in these four hearing offices and have done so for over 17 years. We are well known in these hearing offices, and over time we have come to know the specific styles of each judge, what they prefer during the hearing, and we adjust our presentations accordingly. Would you hire a divorce lawyer from California? 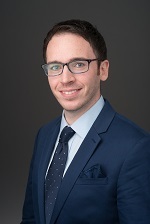 A real estate lawyer from New York? An auto accident lawyer from Kansas? No? So don't hire a Social Security Disability lawyer from far away who tries to service a clientele across the whole country. Phone appointments available. We know that many of our clients would find traveling to the lawyer's office a major difficulty preventing them from getting professional help with their claim for disability benefits. In most cases our work can be completed via email, telephone interviews and by exchanging all the needed paperwork and signatures by using mail, fax or internet. Since we know our clients have a lot of difficulty getting to us, we set up our practice to service you without requiring that you travel to us. Our clients appreciate the convenience that we provide them and they thank us for it again and again. Probably not the people you expect. You may have submitted your initial SSDI (Social Security Disability Insurance) application online, or perhaps you mailed it in. It’s even possible that you handed it over the counter to the pleasant clerk at your local Social Security office. In any case, you naturally assume that somebody from the Social Security Administration will look at all your work carefully, apply her best judgment, and give you an answer in a day or two. Maybe—you hope—a week at the outside. I'm filling out the Activities of Daily Living questionnaire. What do I write? Social Security sends out the Activities of Daily Living questionnaire to better assess how your physical and mental impairments impact your daily life. This questionnaire asks about your abilities and limitations in performing tasks such as caring for yourself and your household. While your medical records allow Social Security to evaluate your medical diagnoses, this questionnaire allows Social Security to assess how the diagnoses impact your life on a day-to-day basis. 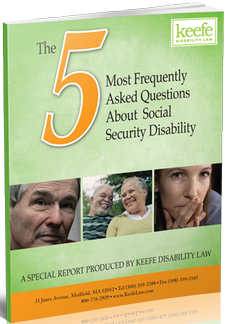 Order John Keefe's book about Social Security Disability and get the answers to the 5 most frequently asked questions that our legal team hears from applicants. 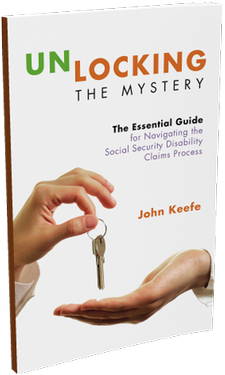 Get John Keefe's free book "Unlocking the Mystery: The Essential Guide for Navigating the Social Security Disability Claims Process" for help today. 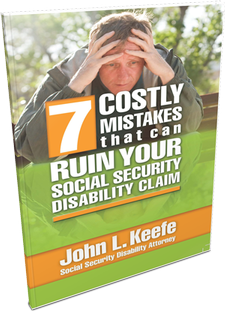 Order your free book written by Social Security Disability Attorney John Keefe, "7 Costly Mistakes That Can Ruin Your Social Security Disability Claim"